'Noepe' was the name the Wampanoag Indians used for Island of Martha's Vineyard, and our Noepe was given his name as a tribute to these original Island settlers. 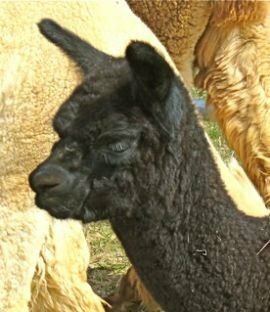 Noepe was the first alpaca ever to be born on the Island of Martha's Vineyard. His birth was truly amazing, as he took his time to enter the world, and landed at nearly twenty pounds! He has shown tremendous growth over the year, and shows great promise as a herd sire. Noepe has amazing staple length and coverage from the top of his head to the tips of his toes, with a bold crimp, and very soft handle for a black. His bite is nearly perfect. Medium Fawn, 837728, Full Peruvian 1/2 Accoyo full Peruvian son of Accoyo Grand Master. Strong, proven genetics new to New England area. Taupe grey face with a stunning dense and fine fibered fleece. Ribbon winner and strong bone and definition. One of the owners favorite in style, fleece and coloring.